Starting with protocol, an uneven situation. Kremlin photo. Are you with Putin and Trump or are you for America? There are greater divisions among those who are for America than there are between Putin and Trump and within their respective entourages. For US voters there are still primaries in many states and there are some options to weigh in November. However, the basic question is whether the government of the United States will be subservient to a cynical foreign autocrat. It only gets worse for Donald Trump between now and Election Day — but he might actually win on November 6, in which case America loses big. On the 2016 campaign trail Donald Trump openly solicited Russian hacking assistance. Long before that, Trump was economically dependent of Russian “oligarchs” — not hereditary rich kids but the mobsters who looted the public assets of the old Soviet Union after its collapse. That caste is Vladimir Putin’s power base, which in effect means that Putin will know just about all that there is to know about Trump’s money laundering services for these people. Trump can be blackmailed about it. 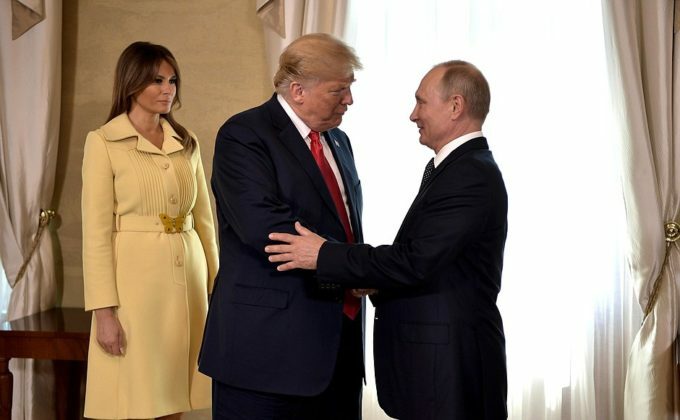 The president of the United States is afraid of Putin. Trump appears to be so intimidated, so sold out, so frantic about truths that have yet to come to light, that he feels compelled to support Putin against the CIA, the FBI, the NSA, US military intelligence, state and federal prosecutors special and ordinary, the Democrats and now a growing number of Republicans. Trump having declared the European Union to be America’s principal foe, he and Putin held a press conference. Trump abandoned any pretense of defending America. He vouched for Putin’s denials of that which is already well proven. Russia interfered in US elections in unprecedented ways and did so for the short term benefit of Donald Trump. That happened. Does Donald Trump, and does that one-third of Americans who will follow him anywhere because he’s a white racist, figure that they might benefit from the same sort of Russian assistance again? Do they figure that by vote suppression and fraud they will win regardless of what Putin does? Or is it that they are like little kids who don’t look that far ahead? Two things coming out of the special prosecutor’s office over the weekend before Trump’s meeting with Putin seemed to have spooked many Republicans who were in lockstep with the president before then. In the indictment of Russian GRU officers for computer crimes against the United States, there was mention of an unnamed congressional candidate who asked for and received documents stolen by the GRU for his or her 2016 election campaign. Surely it was seen as a shot across the bow to GOP elected officials complicit in the Russian offensive or in covering for other politicians who were. The day before the Helsinki meeting, a Russian woman allegedly representing Russian interests through the National Rifle Association was arrested as an unregistered foreign agent. Is she about to become state’s evidence in a case against the NRA? Words of disapproval from many Republicans in the wake of the Trump’s adventures on the other side of the ocean — including from a bunch of Fox News people — have in many cases the sound of panicky retreat, of desertion or mutiny. Trump will find replacements. There will be Democrats and Republicans on the ballot. In some places those who put America before Putin will be able to find Republicans who agree with them about that. But mostly Putin and Trump must be stopped by expelling Republicans from elected offices. Tip the Congress to blue and Trump won’t be able to get funds for his betrayal of America. It’s necessary. But it’s not sufficient to solve the nation’s troubles. America needs to cure the maladies that led to the selection of a narcissistic con man as president in the first place. There are urgent matters of bread and butter, of war and peace, of freedom and democracy to address. Old slogans, concepts and stereotypes won’t do. The government may be paralyzed for a time as we sort this out. But move on we must. At the end of the Trump interregnum in American sovereignty and democracy we will only be able to move forward. There will be no return to the past. We need to elect good people with good ideas — including an honest and loyal opposition — to get on with the nation’s life after this unfolding crisis. Political appointee Gilberto Ferrari, in his role as manager of the ETESA power grid company, has sparked nearly unanimous national protest with a proposal to pass on the cost overruns from a contract with the Brazilian thugs of Odebrecht to someone else. Now he has another contract to put out on Panama. He’s pushing privatization legislation. If such a thing passes, the norm is that he jumps out with a platinum parachute and a rapacious company takes over and starts to raise rates and cut services. A discredited legislature gave the guy a hearing. Surely the deputies are most interested if they get a cut of the action. How to begin solving Panama’s budget mess, which is not just ETESA? First of all, without Gilberto Ferrari, and without paying him a million or more dollars to go.